Staying fit and healthy is a very common New Year’s Resolution, and also one of the most difficult to keep. It requires a lot of physical and mental discipline to stay focused on your goals, but with the right tips and inspiration, it can be a lot easier this coming new year. Here are some of our best ideas to stay on track, keep yourself motivated, and see results throughout 2019. The first step in creating an exercise plan for the new year is to ensure that you’re both mentally and physically ready for the challenge, and you have a supportive group of friends and family to cheer you on. If you fear that you may have a physical hurdle in the way of your goals, speak with your doctor to make sure you’re healthy enough to start. 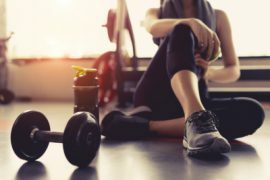 If problems do arise, you can easily find a personal fitness trainer that will help you overcome your issues and get you on the path towards becoming a stronger and healthier version of yourself. When you’re mentally and physically prepared, ask your family, spouse, and close friends to help you stick with your goals. Having an encouraging support group could mean the difference between success and failure when it comes to keeping your New Year’s resolutions. Before you start, it’s also very important to set up a realistic plan that you can add to your already busy schedules. Determine which kind of exercise you’d like to try. Would yoga be more suited to your body and goals? Are you ready to participate in strength training? Also, don’t be afraid to experiment and try a variety of different exercises to find which one works best for you. This is also the time to decide which days of the week and how much time you’d like to dedicate to your fitness. We highly recommend starting out a three days a week for at least an hour to get your body used to your new routine. Once you choose a fitness schedule, stick with it! No excuses! Even if you’re tired, busy, or just don’t feel like going, do it anyway. We promise that dedicating yourself to your goals is one of the best ways to overcome the challenges that you’ll face during this journey. We understand that it’s easy to compare yourself to others while in the gym, especially the ones that are lifting over 100 pounds and make running on the treadmill look easy. However, those people are the ones who have dedicated years to their own personal fitness, and you’ll get there eventually. Please don’t expect that you’ll be a fitness pro and be able to put on those smaller pants within a week. These things take time and require you to have a firm understanding of your own body. Know your limits and personal challenges, and take your time getting to the next step. Also, don’t push yourself too hard! Doing so will only make you resent what you’re doing, and possibly even yourself. Set realistic goals for yourself and follow up on them. You can also add little things here and there that will make it easier for you to get where you want to be, such as taking a friend to the gym with you or allowing yourself a little treat each time you reach a milestone. At Hawley Silk Mill, we provide a safe and judgemental-free environment to help you achieve your own fitness goals! Lake Region Fitness is Hawley, PA’s, premier fitness center and features state-of-the-art equipment and a wide variety of group classes and personal training sessions taught by certified instructors. From kickboxing and yoga to free weights and spinning, you’ll be sure to find a fitness plan that is ideal for you and your body! We are also the home of Mountain Laurel Pilates Studio, a full-service fitness studio that will teach you everything you need to know about mastering the art of Pilates. This form of exercise may be perfect for you if you’re looking for a plan that will lengthen and strengthen your muscles, increase flexibility and coordination, and promote relaxation and overall well-being. After participating in a fitness class or using the equipment at Lake Region Fitness, we invite you to explore all the fun things to do in our vibrant lifestyle center. Indulging in a cup of coffee and healthy lunch from Cocoon Coffee House and Bakery could be a great way to reward yourself after a rigorous workout. You can also relax and your body and mind by browsing through our variety of interesting shops or the Looking Glass Art Gallery. However you decide to spend your day with us, we’re sure you’ll want to come back and enjoy it all again and again.